My daughter LOVES play-dough. She loves squishing, chopping, rolling, plopping, mixing and creating. Her brother? Well he likes to eat it. Therein lies the problem. It can make for a difficult and not so enjoyable time if I spend most of it retrieving bites of soggy, spit covered dough from brothers mouth. Aside from that, sister tends to become hysterical when she noticed that her play-dough pile is depleting. While the colorful poo-poo make changing his diapers entertaining, I do worry about brother actually consuming play-dough. So, why not only let sister play with it? Well, play-dough is an excellent sensory and fine motor activity! I believe in therapy through play and like finding any opportunity I can for both of my children to participate. Play-dough can be rolled between fingers, squeezed in hands, rolled into balls, cut with butter knife, used with cookie cutters, the options are endless. It also provides an excellent opportunity for brother and sister to play together and interact with each other but maintain a sense of individuality. 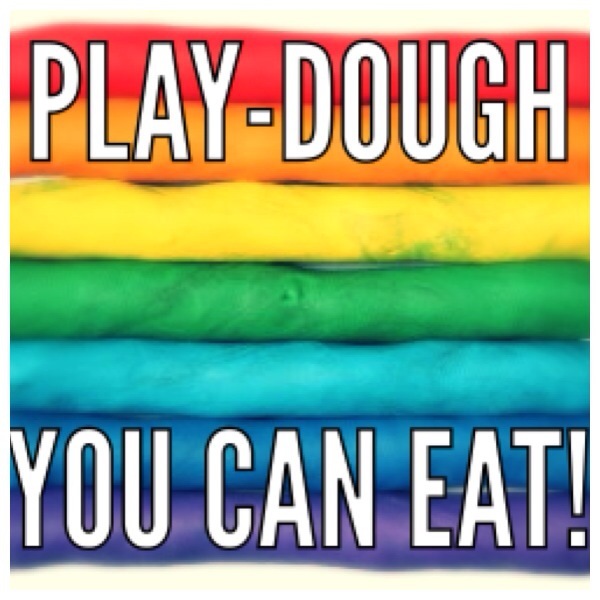 Simply put, I love play-dough and so do my kids. What do I do about my play-dough muncher? 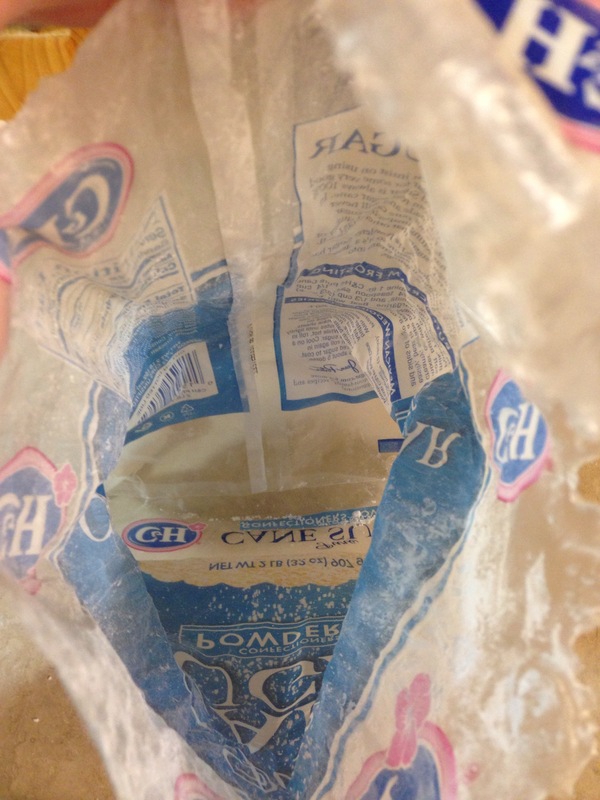 Make my own safe to consume edible play-dough! I found several recipes using kook aid that looked pretty good, and had almost settled on making that and then I stumbled onto the easiest, most delicious recipe (link here) one could imagine. It consists of two ingredients: frosting and powdered sugar. The recipe called for 1 cup of frosting. I scooped out one cup and plunked it in the bowl. I then licked my fingers, and the spoon. (My kids, my germs, same thing). I peered into the can and realized, that it took up most of the can of frosting so I figured I’d just use the rest (more play-dough is better right?). Wrong, very wrong. I underestimated the amount of powdered sugar it would take to “dough-ify” the frosting and didn’t have enough. Even after using the amount it called for and the remaining 1/4 bag of powdered sugar I had, the dough was still pretty sticky. I took some time to contemplate options and nibble on some dough. Holy sugar high! I shouldn’t have been surprised seeing that the ingredients were frosting and powdered sugar, but wowzers was it sweet. 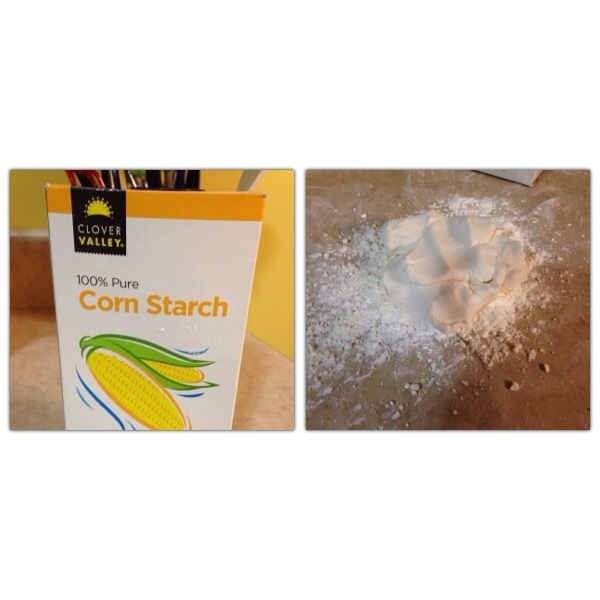 Thinking of a way to thicken it and not add go the sweetness I turned to corn starch. I sprinkled the corn starch onto the counter, separated the dough into smaller balls and kneaded it like bread until the consistency was pliable but not sticky. I used my favorite frosting colors and kneaded them through the dough. 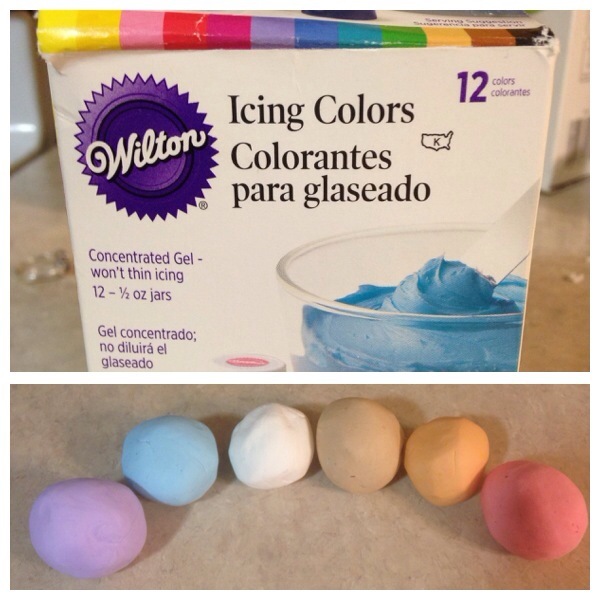 You may want to wear gloves for this, otherwise your hands will look like the inside of a paint mixer. The end result was a lovely smooth textured, cloud like play-dough that both of the kids will love, mom too! I love to have my kids help with cooking and creating in the kitchen, I would recommend making this during nap time or bedtime as the powdered sugar or cornstarch can get a little (a lot, I mean a whole lot) messy. I would not participate in this activity just prior to any special event, as the sugar consumed may increase the activity level of your child. Imagine pinball, but add in screaming, squealing and diapers. This only occurs if the play-dough is consumed, however, it tastes really blasted good, so one should assume that it will be, possibly in large quantities. 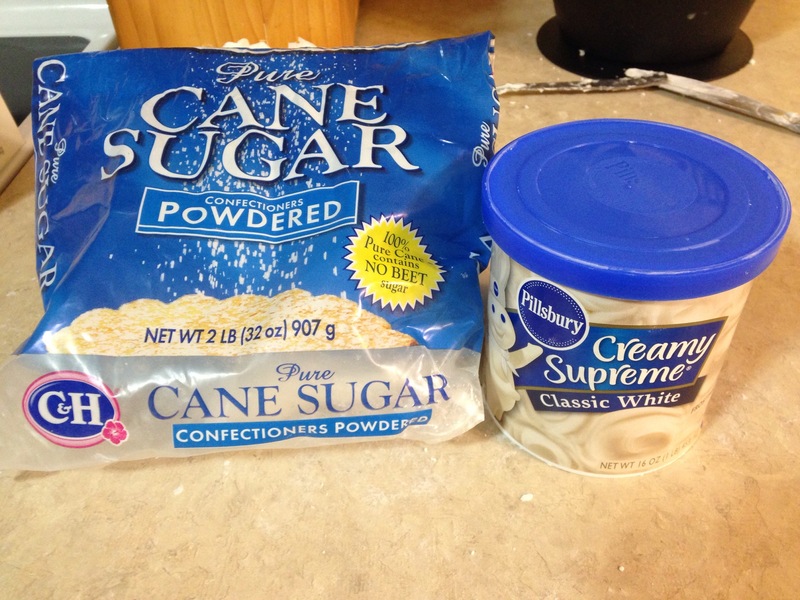 You can substitute half of the powdered sugar for cornstarch. The consistency will still be the same, and it’s still suuuuuuper sweet. Below is the link to the recipe that I used above and two extra ones that are just as amazing! This looks beautiful! But (in our house anyway) it would last about as long as a tub of frosting. The playdough I grew up with was edible in that it wasn’t anything poisonous in it, but had a whole lot of salt (and no sugar) in it, so nobody’d actually want to eat more than a bite of it: it tasted bad. 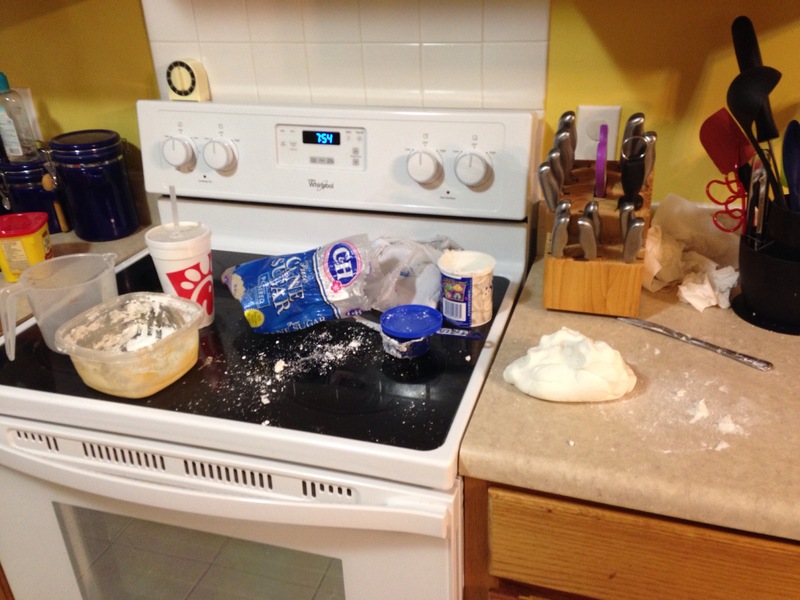 That might help if “playdough is not for eating” is a lesson to be learned. Otherwise, why not just let them play with cookie dough? Pasturized eggs only of course. My son will eat it if it tastes terrible (we no longer play with shaving cream for this reason 😉 ). For us I was looking for an alternative that I felt more comfortable letting him consume. I really prefer the peanut butter playdough over the frosting one, but both are good! Honestly, though, after a few bites and licks both of the kids decided it was too sweet and didnt eat anymore! The cookie dough idea sounds delicious too!